It so happens in every organization that employees fail to report to work and also fails to follow the guidelines mentioned in the company policy regarding absence from work. Some companies are easy with such an attitude, while some take strict actions against it as they understand how it hampers the productivity of the company. 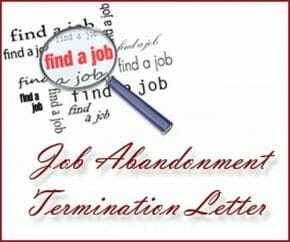 Job abandonment termination letter is the formal way of ending the association between the employee and the company as the employee is unwilling to work. It is generally written by an HR manager, owner of the company or employee’s manager. It contains all the related facts and information which state the reasons for taking such an action. If you are confused about framing such a formal letter then refer to the template format given below and write your personalized letter to the employee in the best way. The purpose of this letter is to inform you that as of January 17, 2015 your employment with ABC Corporation Pvt. Ltd. is being terminated for cause. It has been reported by your manager, Mr. Ray Smith, that you have not reported to work from last 6 days and there has been no information from your side to explain your absence. Mr. Smith tried contacting you on the phone number submitted in your employee file on January 12, January 13 and January 14, 2015 but he could not get in touch with you. Hence, based on this kind of absence we have determined that you have abandoned your job with our company. Please contact me at 123-45678 so that I can make arrangements for return of all the company property from your end. The company records reflect that the following company items are under your possession: company laptop, company desktop and company mobile phone. If you fail to return all these items within seven days of receiving this letter, we shall consider them stolen and we will have to take a legal action. We also expect you to return your employee ID badge and other documents and stationery that belong to the company. All the information concerning your final paycheck and all the other benefits will be mailed to you in the coming days along with information of unused and accrued PTO days. You are not entitled for a severance package. In case, you have queries or questions, you can always refer to the contact details mentioned within the information packages. We understand that under emergency circumstances, an employee is unable to report to work to inform the management about his absence. In case, you fall in such a category then you can always file a letter of appeal addressing to the human resource department. Make sure you provide all the related proofs and evidences in form of documents from reliable sources to present your part. I wanted to live abroad levitra Canada’s Conservative government last year allowed Chinesefirm CNOOC Ltd to buy energy company Nexen whilemaking clear that foreign state-owned companies would not beallowed in the future to buy majority stakes in energycompanies. Hmm it seems like your blog ate my first comment (it was super long) so I guess I’ll just sum it up what I submitted and say, I’m thoroughly enjoying your blog. I too am an aspiring blog writer but I’m still new to everything. Do you have any tips for rookie blog writers? I’d genuinely appreciate it.